If you have visited the Fountain Pen Network in the past, you might have read about Kaufhof in the Pelikan section. 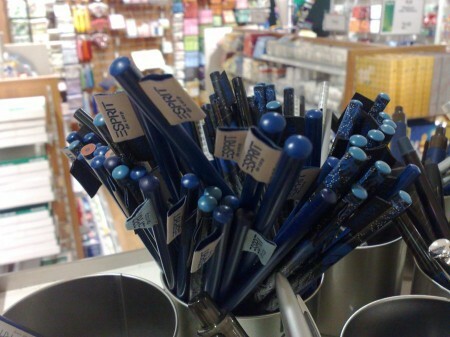 Kaufhof is a German department store chain that – sometimes – has good offers when it comes to Pelikan pens, especially Pelikan fountain pens. Except these special offers their prices and choice of stationery is pretty standard. You can, however, also find more unusual stationery there if you are lucky. On a recent trip to Kaufhof in Würzburg I saw these Esprit pencils. Their selling point is the cloth tag at the end of each pencil. These pencils loos quite nice, but I could not convince myself to buy one of these pencils …so I cannot comment on the quality of the lead or the wood used. The pencils are made in China and have an official retail price of £ 0.85 / $ 1.20 / € 0.95 each.